Do you like to experiment with different hosiery shades? When I just started selling pantyhose at local women events, I had women come up to me and ask “What colours do you have?” while browsing. Surprisingly, I rarely sold shades other than black and natural. I always wondered, why ask if you would still choose black? There was one lady who worked for the Board of Trade, she was East Indian, with a darker skin tone. This was the only person who wanted to have something darker, like Cappuccino and Taupe shade, to match her skin tone. I have some styles in my shop that come in a variety of shades. Have a look if you’d like in case you are one of those who likes to explore different options. One of my favourite writers, Tim Ferris, said that he purposely stopped wearing black at some point and actually experienced some enjoyment as a result. I am trying on different colour shoes in a store. Wearing Fortsisima by Gatta pantyhose in light grey shade. 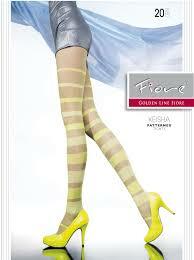 If you are looking for some exotic shades like Cypria, Cappuccino, and so on, have a look at these tights. They have a very wide pallette of colours. XL is also available! Both of these cool styles are now 50% Off! If you are looking for fashion colours like violet and orange, have a look at Paula 40 den tights and at Ester stay up stockings. I brought in a lot of shades! Hosiery shedding colour in the laundry – Why? From what I know, the dye is actually supposed to penetrate the yarn, not just sit on top of it. At least none of my own pantyhose shed colour. But I hear about this kind of stuff happening to other people. For example, women on dance forums complain that their dance hosiery fades after washing. Any idea why? Cheap brands? Chinese production? 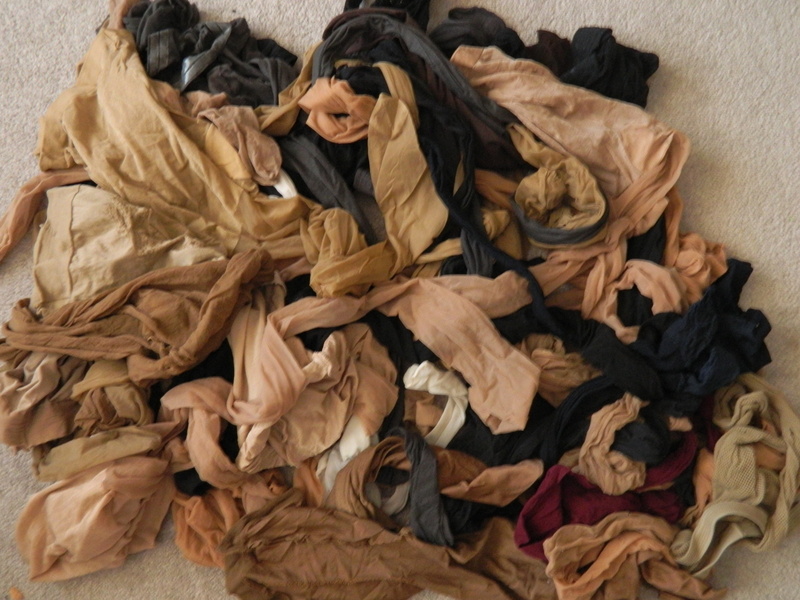 Is there such thing as a wrong shade of pantyhose? I found this photo on a forum. This woman is wearing pantyhose that looks slightly greener than her own skin tone. Isn’t it kind of strange? I would imagine it would look much better on a black girl, for example. Do you agree? I’d be interested to hear your thoughts. OR COULD THIS BE A COLOR CAST FROM THE GRASS AND TREES? I agree with David. Beware of color cast! If Mike is right about the colour cast, I’d say that she is actually wearing a good shade of pantyhose judging by the corrected photos. In terms of her skin tone – I think that the poor girl simply got a bit of a sunburn in the summer. A young woman in lingerie is browsing through her pantyhose while getting ready for work. Nowadays, hosiery comes in a huge variety of different styles and colours, which means that the modern woman has a lot of freedom when it comes to what she wears on her legs every season. However, this variety also means that it is easy to get carried away and choose something that is not appropriate for the occasion. For example, if you are a professional woman, going to work in a place with a dress code, you should avoid wearing bright colours or ‘busy’ patterns. These can make you look less professional, and if they clash with your outfit, the effect can be even worse. According to the etiquette book I’ve read recently, in their hosiery section they suggest for business women to wear light colour like beige or tan hosiery in the summer and black or charcoal in winter. 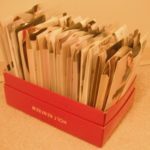 This is how I keep my pantyhose – in original packaging stacked in a box for easy retrieval. I strongly suggest to keep your hosiery well organized. If this is something that you wear a lot, it is a good idea to have plenty of it and keep it well arranged patterns separately, stay ups separately, and so on. That way, if you have been relaxing in the morning over breakfast and realize that you are almost late for work, you will not have the disastrous realization that you are out of proper hosiery. If you have some damaged hosiery that you fixed and still wear with boots or under pants, make sure it is kept in a separate bag all together from all the good ones. As you know, I am a big fan of recycling myself. I strongly suggest to keep flawed pantyhose (that are to be worn with boots or under pants) separately from the new ones. You don’t want to be late for work in the morning because you had to sort through a pile of hosiery. If you are not into separating it, it’s better to throw it away because there is nothing worse than putting on a pair of hosiery and arriving to work, only to notice that they have a run in from the last time your wore them. Knowing how fragile the hosiery can be, it is suggested to keep an extra pair in your purse or at your desk. I also found this being mentioned in the etiquette book that I’ve read. On the weekends, you can be more adventurous with your hosiery, perhaps going for some colours or patterns. We all get tired from our work clothes. Keep in mind the season and the occasion. But hey, even when not at work, it is a still important to make sure that the rest of your outfit goes will with them in order to avoid looking like a clown. A rule of thumb is that if you are wearing patterns in your clothing, your hosiery must be plain. If you are wearing plain clothing, then you can consider adding patterned hose to complete the outfit. Supermodel Natalia Vodianova is wearing all red, but in my opinion this Slavic beauty is overdoing it. I’ve been taught not to wear only one colour. Is Red the colour of Love? I read something interesting in Vancouver’s Metro Newspaper. A new study looked at what attracts men to women – it proved that red is really the colour of love! Never estimate the power of a woman in red. Men were asked to look at photos of women. Part of those photos either involved a woman wearing red or were framed in red borders. As a result, women either surrounded by red or wearing red were ranked to be most attractive. Primitive, isn’t it? I guess that can help women to determine what colour dress to wear to a date with someone you’d like to impress. I think it’s time for me to add more red to my wardrobe! In some cultures the word “red” is actually the same word as “beautiful”. For example, in old Slavic languages saying “red maiden” was equivalent to “beautiful maiden”. This expression can still be found in old Slavic folk songs. This article reminds me of something that I’ve read in a book called E-Myth about business. It turns out that blue business suits will outsell brown business suits, regardless of who is in them. We don’t notice, but a lot of our decisions are not logical decisions at all, rather subconscious.